Companies make purchases every day that aid in the operations of their business. It is important for these companies to track the whereabouts of their investments. For companies struggling to find a reliable solution, GigaTrak’s Asset Tracking System is the perfect fit to find your assets right when you need them. 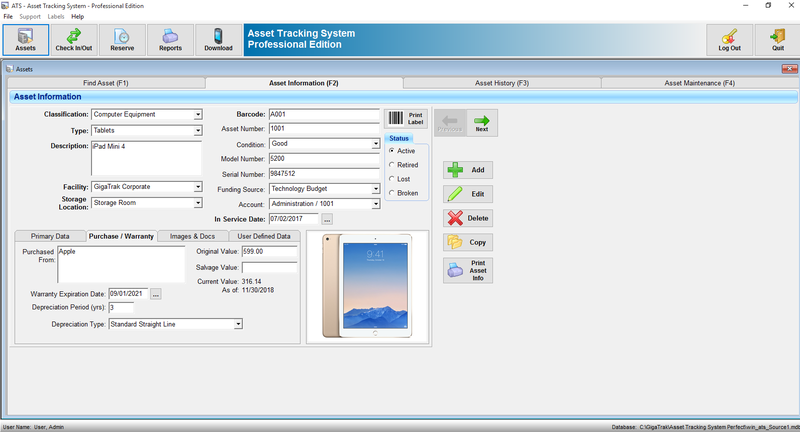 With Asset Tracking Software, assets can be easily assigned and tracked to either a location or person. The system retains records of usage, maintenance, and history of assets. 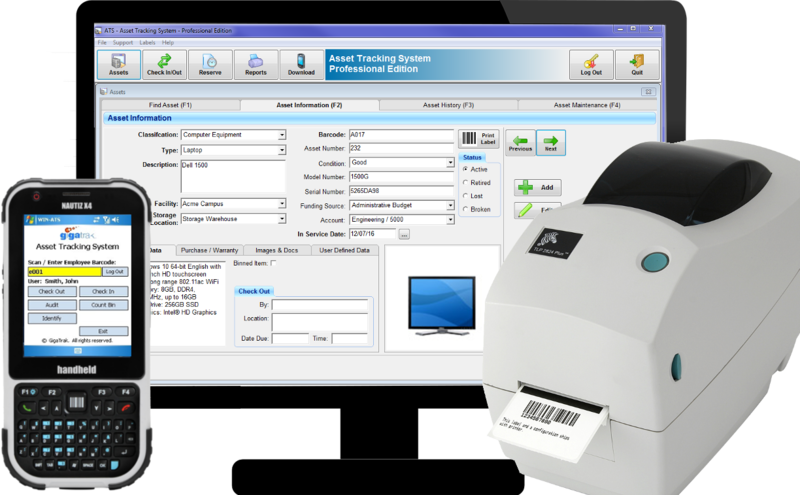 Everything is logged using a barcode-scanning system via a standardized check in/out process. Keeping a historical data-trail for each asset helps to locate assets when needed, reduces disruptions in operations, and avoids the expense of purchasing unnecessary replacements. 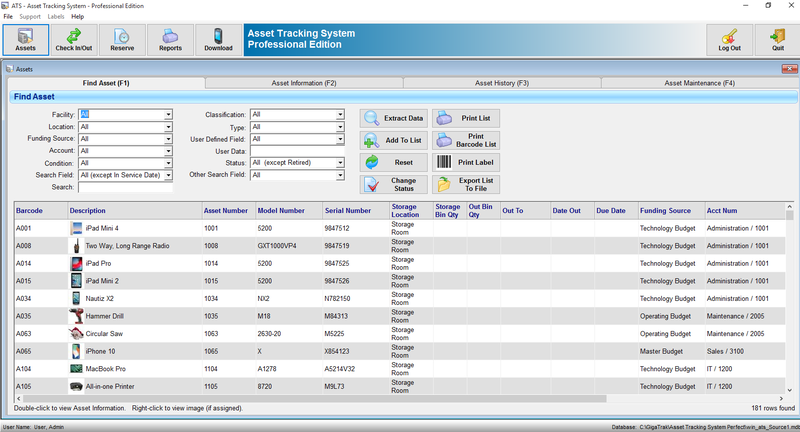 Track your assets to a person or location with a simple barcode scan. Save time and money for your organization with an efficient tracking system. Complete Asset Info Including Serial #, Model #, etc. ATS is used by School Districts, Universities, K-12 and other Education Institutions. You can track material items for Staff, Student, and Faculty members alike. Businesses of all types rely on ATS to meet their asset tracking needs. 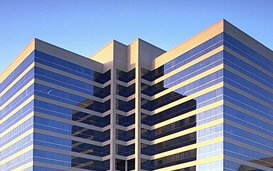 Our customers provide services in technical, financial, medical, entertainment, and other industry segments. Local, State, and Federal government agencies look to GigaTrak for their Asset Tracking needs. Police, Fire, Military, Embassies, Space & Aeronautic, Municipalities and governing groups are some examples of existing ATS users. Electrical, HVAC, Construction, and Industrial companies use GigaTrak Asset Tracking to manage the large volume of equipment critical to their day-to-day operations. 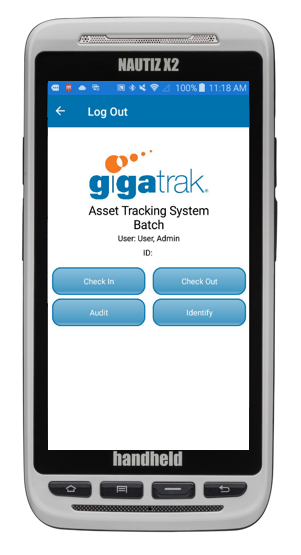 GigaTrak’s Asset Tracking System (ATS) Basic Edition includes mobile handheld-terminal support, available in batch or wireless mode. 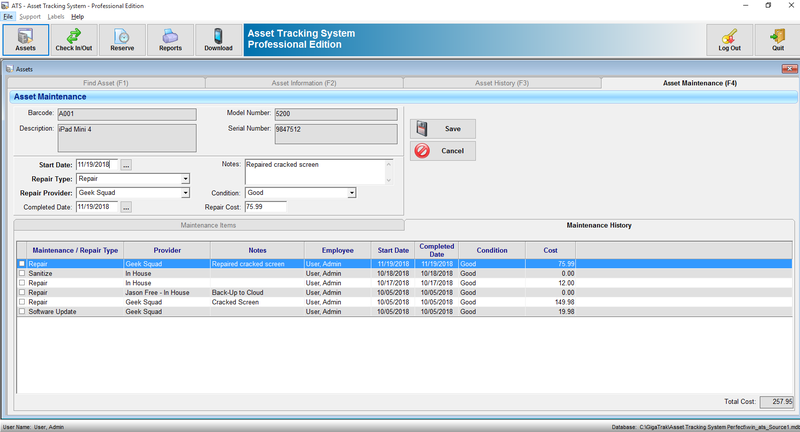 This edition of our Asset Tracking Software also adds a reservation function, which gives the ability to find or make reservations for assets. Basic Edition also contains an embedded label-designer with print capability. 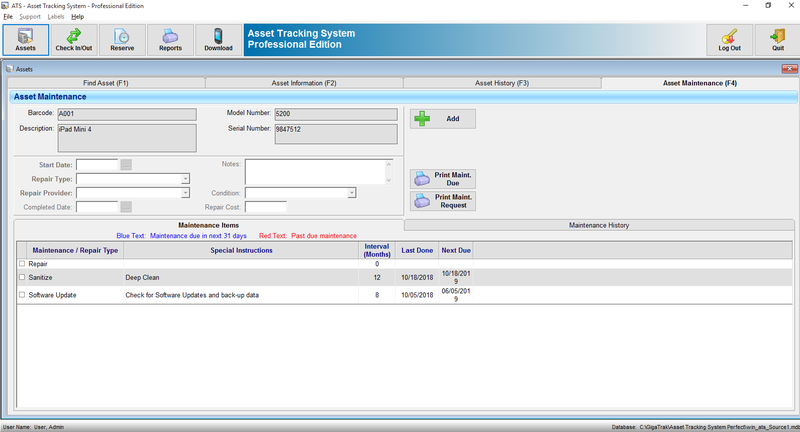 GigaTrak’s Asset Tracking System (ATS) Professional Edition expands upon the Basic Edition of Asset Tracking Software by adding an asset-maintenance function. This allows for scheduling, requesting, and tracking maintenance on any asset item as well as the ability to see maintenance items, maintenance history, and to print maintenance history and requests. 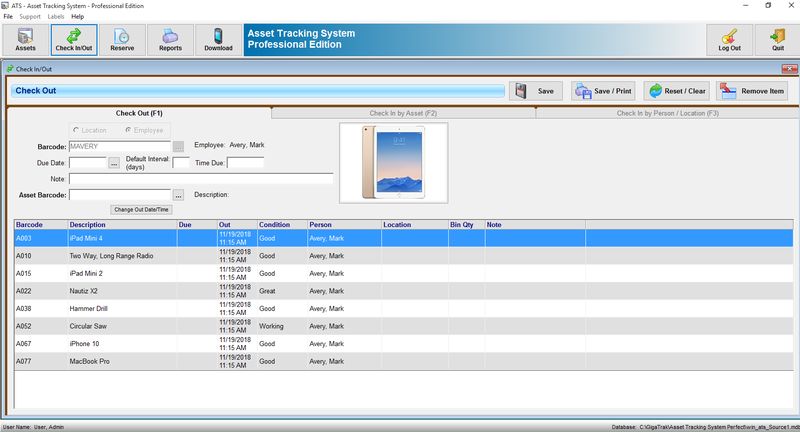 GigaTrak’s Asset Tracking System (ATS) School Edition develops further with a member function to allow for additional organizational members to check in and check out assets. Personnel can be divided up into three member categories with four user-defined information fields. Every organization has assets that are critical to operations. Know where they are at all times with our powerful, easy-to-implement, and easy-to-use Asset Tracking Software.